The Wichita Falls Police Department is affording young people the opportunity to experience law enforcement first hand through the Junior Police Academy. Students will learn the basic functions of a working police department, as well as have a chance to explore the idea of a law enforcement career. 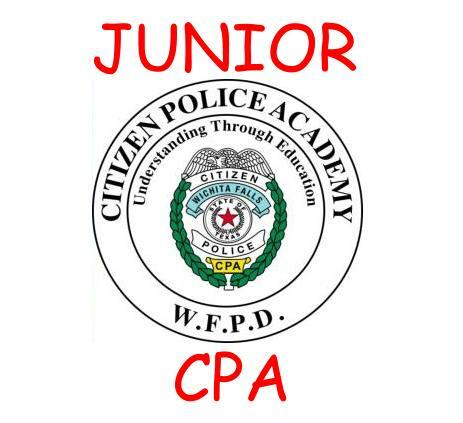 The Junior Police Academy will be held at The Wichita Falls Public Safety Training Center, 710 Flood Street, Wichita Falls, Texas. There is no cost to students who wish to attend the academy. For more information, please contact DARE Officer Danette Sheehan at 940-720-2181 or email at danette.sheehan@wfpd.net or Officer Kris Henning at 940-720-5006 kris.henning@wfpd.net. When: July 27th— 31st, 2015, Monday-Thursday will be 8:30 A.M.-3 P.M. and 8:30 A.M.—Noon on Friday. Who: Anyone who attends school in Wichita Falls (public, private, home school etc.) and is going into 7th or 8th grade for the 2015-2016 school year or lives in Wichita Falls. Where: Wichita Falls Public Safety Training Center; 710 Flood, Wichita Falls Texas. Application deadline is July 1st, 2015. Seating for this initial group is limited to 24.